The Hawa Mahal or the Palace of Wind is a Jaipur landmark which was built by Maharaja Sawai Pratap Singh way back in the year 1799. The Hawa Mahal displays fanciful architecture and has been so named because the palace has specially latticed screens and arches for an unbridled flow of air currents in a set pattern with the passage of the sun. Till the recent past, ladies of the court from within the palace positioned themselves by the balconies to watch processions passing through in the streets below without themselves being observed by the people. The Hawa Mahal was designed by renowned architect Lal Chand Usta and is built of red and pink sandstone and is a living testimony of Rajput architectural grandeur. The Hawa Mahal is shaped like a pyramid and has a staggering 953 small windowpanes and all of them are conspicuous by their miniscule lattice work, miniature balconies and vaulted roofs all of which are exquisitely designed and engraved. Hawa Mahal is accessible from where the City Palace is located and entry is via a majestic door which leads to the large courtyard and is clustered with two storied edifices on three sides. Hawa Mahal offers breath taking views of Jaipur city, its palatial edifices and quarters. There is no sign of any ornate embellishments adorning Hawa Mahal. 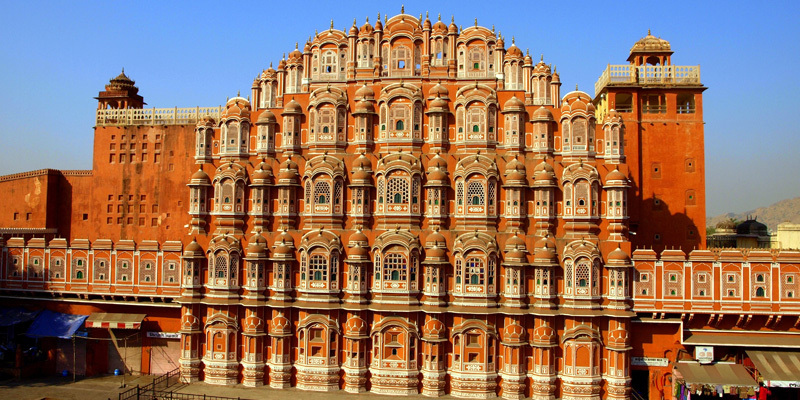 Presently Hawa Mahal is managed by the Department of Archaeology, Government of Rajasthan. The most appropriate time to visit Hawa Mahal is early in the morning at the time of sunrise.